Great watch right out of the box. However I expected it to be a little bit bigger since it is a G-Shock, but it’s not too terribly small that it looks like it belongs on a woman. For my purposes, this is a great watch. I plan on using this watch primarily when I travel, so it fits the bill with its easy to read hands and world time function. It looks real nice but will likely not attract too much attention since it's not flashy or extremely large. Solar power from any light source and atomic timekeeping make for a worry-free, low maintenance timepiece. All the other functions of a "digital" watch like stopwatch and alarm are a bonus. The downside of this watch is fairly well-known: the 3 small dials can only be read with relatively good lighting. The light on the watch will not illuminate the face sufficiently to read these dials. I think this watch wears smaller than it is because the actual face of the watch is much smaller than the total width of the case. So if you want a big G-Shock watch, this one is definitely not for you. What a great watch, I’ve never owned an atomic watch and it’s cool. Love the solar power no battery’s and keeps time perfect as it sets its self on its own. The band is comfortable and the watch is low profile compared to most G Shocks. Has every function you’ll ever need. 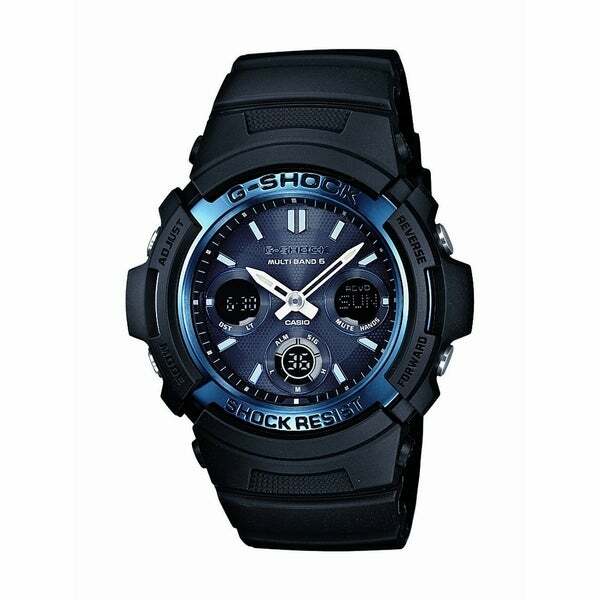 I bought this watching thinking it was a guys watch... since it says "Casio Men's AWGM100-1ACR "Atomic G Shock" Watch". It is a cool watch... But I had to give it to my wife for her G shock collection. I own 10 G shocks... so it's not a terrible loss. I have plenty others to wear. 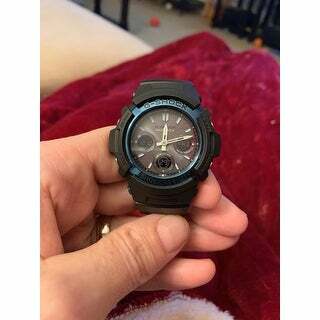 The face is about the size of a Baby G shock... at the biggest. I am a 170lb guy and I couldn't wear it in good conscience. I love G shock, and I love the watch... Just not for a guy. I'd give it 5 stars for a girl though. I had bought this watch for my husband specifically for work. All the watches I have bought my husband seem to break as he works with his hands, Sometimes getting the watchpiece stuck on a tool or whatever the case may be.This watch fits him perfect and he loves it. It has held up in durability as far as the strap goes. More expensive watches I have gotten the strap has broken off in a few months and to get them fixed you have to send off to a specialty place and pay 80.00 just to replace the band, Very happy with this purchase. Fantastic watch. I prefer analog watches. This is primarily that. Hands move out of the way for other functions. I rarely use those functions except when timing grilling. The auto radio-sync feature is great when dealing with DST. Hands move themselves! Great watch. Just what my husband likes. I'm glad you carry such a nice selection of G-Shock watches. Thanks for making my shopping easy . I like that this watch has the date, day of the week and is easily read. I also really like the fact that it doesn't use batteries. It was fairly inexpensive, but looks very nice. I am sincerely going to enjoy wearing this watch!! Bought this watch for my boyfriend and he loved it. It is a little hard to change the time with the instruction booklet included, very small print. Very nice watch! My son received many compliments. Better in person! The husband loved it. The middle between the super bulky and classic. Perfect for him and his workouts! As always! Super fast shipping! Will definitely be ising Overstock again! "Does this watch come with all manuals, boxes, cases , protective material etc?" Yes, this does comes with all manuals, boxes, cases , protective material. I hope it helps. Atomic watch. Ultra accurate. ALSO ITS LOOKS. Be advised, I ATTEMPTED TO PLACE THE ORDER AT LEAST THREE TIMES. IT WAS NOT UNTIL I RECEIVED A E MAIL FROM YOU THAT I REALIZED THE ORDER WAS (NOT ) COMPLETE. Have zero idea why the order was not complete on the first attempt. "Is this watch synch to the atomic clock in CO???" Yes, this watch synch to the atomic clock in CO.